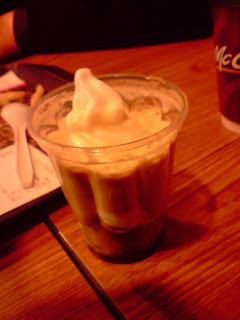 When I first visited Korea back in April 2009 I saw an 'affogato' poster in the window of a McDonald's and I assumed it was just a completely 'Konglish' that they invented. A quick Wikipedia searched proved me wrong. I still did not try it until my second trip to Korea in September 2009. Its quite simple really. Its the McDonald's soft serve ice cream with a shot of espresso poured over the top. The original had the bottom of the cup lined with the chocolate sundae sauce, but now they add Oreo pieces to the chocolate sauce, I can't say if the Oreo pieces really make much of a difference, but you can taste the flavour when you eat them. The hot espresso causes the ice cream to melt pretty quickly, so you have to eat it as fast as possible. When it melts, you can just drink the sweet goodness straight from the cup. Surprisingly unlike everything else at McDonald's the Affogato has not had a price increase in a long time. Even with the addition of Oreo pieces its still only 2000KRW, the same price I paid back in 2009, which is nice, as everything else on the menu has increased between 10-40% since then. I'd like 12 of these, RIGHT NOW!